Never has a flute of champagne been thrust into my hand as I arrived for an interview, until today. I’m in Reading, which, considering that I’m one of those ghastly London-centric metropolitan elites, I did not realise was just 25 minutes away from the Capital. It’s quickly becoming a hi-tech hub, away from the exorbitant rents, besuited hubbub and hubris of the City. Remarkably enough, Reading isn’t full of people making arbitrary daily toasts – there is reason to celebrate today. It’s the inauguration of Herjavec Group’s new UK headquarters. The sixth floor of the White Tower still smells of fresh paint, with the modern, clinical pastiche one might expect from a global information security firm. Giant screens dominate as you enter, a plethora of technology after that; then a control room which feels like one is peering into a Jason Bourne movie. It’s all really cool. I’m here to meet the man himself. 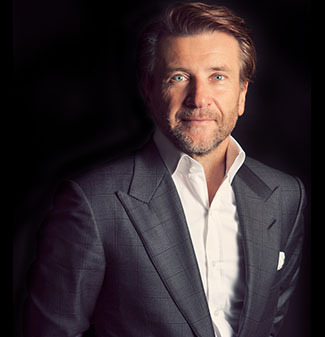 British readers probably won’t know of Robert Herjavec – the multimillionaire star of the Canadian version of Dragon’s Den and its US counterpart, Shark Tank. He’s also featured on Dancing with the Stars and myriad other shows and films, including a cameo in Sharknado 4 (which if you know, you know). On Shark Tank, Herjavec is the “Nice Shark”, and tells me that in fact, coming to the UK is a relief, if only for the anonymity from starstruck fans. But he’s more than just a (very) pretty face. He has the air of a self-made man, and his career in cyber security, spanning some 30 years, is testament to that. The world is at a pivotal point: the rapid proliferation of digital technology over the last decade or so has made the threat from malicious actors ever more pertinent. As one grows, so does the other. Cyberspace has mutated beyond recognition since the Herjavec group’s inception in 2003. And while he’s certainly not sanguine about the future, I suggest that the current spate of attacks surely makes it a good time to be in managed cyber security. Donald Trump’s ascension to the White House has been mired in controversy over his alleged links to Russia. “Russian Hacker” naturally rolls off the tongue, as if to be expected from the motherland of espionage and surveillance. There is a notion that what we “ain’t seen nothing yet” though – one that Herjavec agrees with. There’s nothing new there though. No one is surprised. The wars of the future will not be fought in space, much to the dismay of seventies science fiction writers. They will, and are, being fought in cyberspace though, at a scale the man on the street simply can’t comprehend. Usually during a war, the general public are at least marginally aware of the battle being fought before them. But in cyberspace, the public slumbers. Many have argued that WannaCry and Petya, for example, served as a catalyst for greater awareness. But far more have argued that it’s going to get worse before it gets better. Throughout our conversation, Herjavec brings up Brexit on several occasions – he has after all just invested a fortune in the UK. Post-Brexit, the home secretary has said we are “likely” to stop sharing intelligence with EU through Europol. Her remarks have been largely dismissed as empty rhetoric, but regardless, I question the infallibility of that outcome. Herjavec, having served as a cyber security advisor for the government of Canada, participated in the White House Summit on cyber security, and recently joined the US Chamber of Commerce Task Force for Cyber security, is well placed to answer. The UK has committed to share information with Five Eyes, but perhaps not Europol. If the state is so busy protecting its own interests, does it have a role to play in protecting its citizens?